MARQUETTE — Phil Niemisto’s image will live on in downtown Marquette. 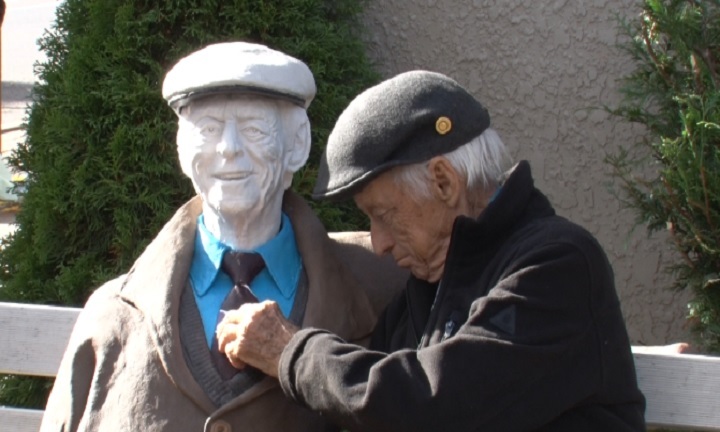 A statue of the downtown Marquette icon was unveiled today in the pocket park named after him. A crowd gathered on the West Washington Street park to watch artist Earl Senchuk reveal the life-like recreation of Phil that took him three months to complete. “It was like there was no procrastination at all. It was literally get up in the morning and work until 7, 8 o’clock every night. I had to do it without Phil being there because I couldn’t have him there all the time, so he would come over and fall asleep,” said Senchuck. The statue is made from steel, foam, mesh, concrete and polygem epoxy. The Marquette Downtown Development Authority thinks the statue is an important work of art for the community. “I think it’s a fun project and I think people should be excited about it. I really believe this is a gift from the community to the community,” said Executive Director of the Marquette Downtown Development Authority Mona Lang. The community raised almost $14,000 for the project. The remaining funds will go to purchasing flowers for the pocket park and paying for future maintenance costs.